gardening in the boroughs of nyc: More things to look forward to next year. We planted so many things this year that we have to wait until next year to harvest. Here are our asparagus plants. I put a tomato cage around it because it was growing so bushy. Does anyone know, after you harvest the asparagus, is that it for the plant? Does the asparagus grow back or is it a goner after the harvest. I can wait to harvest you my dear asparagus and eat you with a little bit of butter, salt and pepper. Yum. In other exciting news, I just read that my beloved Trader Joe's might be opening a store down the street from us! That would mean I would not have to go to Manhattan, Queens or Brooklyn to go there anymore. Here is the article I read. If they do, I will be in heaven! You should only cut or snap off a few larger spears the second year, then let it grow ferns and go to seed, as it is doing now. Next year, cut only the larger spears, then let it go to seed again. Lather, rinse, repeat. You can, in some areas actually get two crops, but I think it weakens your plants and isn't a very good practice. Every year you will get more spears to harvest than you did the previous year. One thing I forgot to mention, you can continue to cut the larger spears, bigger than say, a pencil, over the entire growing season, which is usually around a month (I think...it's been a long time since I grew asparagus). Once all the ferns have died back, cut them off. Very early in the spring, apply some compost or well rotted manure to the entire bed. I'm not a pro at growing asparagus, just telling it the way I did it. Listen to Gran! 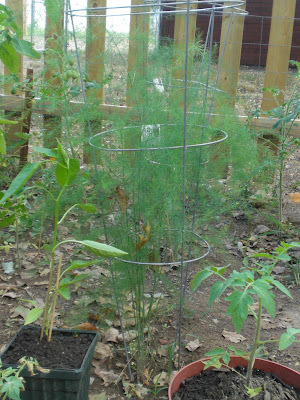 An asparagus bed is a wonderful perennial addition to the garden, it takes a couple years to establish, but you will get lots back from it! My asparagus bed is in its third season and produced a great crop this year (we started with twelve crowns). In Atlanta, we get the primary crop in spring, then sporadic shoots after that. Simply for convenience, I wait until after the first real crop before I cage it, but then it really needs to be controlled, or it's all over the place. Enjoy! Man, you are lucky to have Trader Joes coming to your neighborhood! I have to drive a half hour to get to one. We luv our's. Asparagus is one of our favorite veggies.